This article has been written to commemorate the 125th anniversary of Ananda College. Sri Lanka is enjoying the dividends of peace after many decades. We as a country are moving forward in economic development. Every week we are creating history. Last week it was reported that National Geographic Traveler magazine has named Sri Lanka as being among its top six destinations for world travellers in 2012, lauding the island nation's heritage sites, wildlife, lush landscapes and pristine beaches. This is the beauty of peace. This is the beauty of the country. A strategic window has been opened for the country now. What is this strategic window? This is a temporary period of ‘alignment’ or ‘fit’ between the competitive capabilities of an organization (country) and the key requirements of the existing or new markets it intends to compete in. Technically it means that there is an enormous opportunity for this blessed island. But keep in mind ...this is for a short time period. We should reap maximum benefits from this. This can be in terms of tourism, construction, agriculture, services etc. This is all about winning the war in the economy, while enhancing relationships with other groups. Sri Lanka needs to have its own model to win this as the state of affairs is unique, compared to other situations. Certain adaptations should be required. We have to discover this ‘Sri Lankan model’. The model which is suited to the country, the model which always concerns our proud heritage, history as well as dignity. In this context, the role of Ananda College can be considered as very important. In cricket, we discovered our own model (Sanath-Kalu, “Ohoma Yan..Discourse with team work with discipline) in 1996 and we did it under the captaincy of Arjuna Ranatunga and Management of Ana Punchihewa. Sri Lanka finished the war also in the same style and we witnessed the contribution made by Anandians in Anada Viru Harasara” organized by the Ananda College, Colombo, to pay tribute to the Old Anandians in the Armed Forces and Police held at the Kularathna Hall on July 3, 2009. Distinguished Old Anandians who had performed a pivotal role in the humanitarian mission; Defence Secretary, Gotabaya Rajapaksa, General Sarath Fonseka, Navy Commander, Admiral Wasantha Karannagoda and Director General of Civil Defence Force, Rear Admiral Sarath Weerasekara received the ‘Anada Viru Harasara’ plaques from the President. Senior Old Anandian officers of Sri Lanka Army Maj General Jagath Rambukpotha, Maj General Jagath Dias, Maj General Kamal Goonarathna, Brig Jagath Wijethilake, Brig Mahesh Senanayake, Brig Prasanna Silva and Brig Chagi Gallage received the ‘Anada Viru Harasara’ plaques from the acting principal of the Ananda College. It is quite evident that the contributions made by Anandians were quite remarkable. What was the success story of Ananda? This is all about the proud history, Buddhism and relationships. 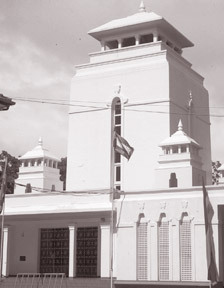 An educational organization identified as the ‘Buddhist Theosophical Society’ was formed in Sri Lanka under the leadership of Colonel Henry Steele Olcott who was a founder member of the Theosophical Society of New York. The names of Ananda College and Henry Steel Olcott always go together in Sri Lankan literature. Olcott was born on August 2, 1832, in Orange, New Jersey. After an early career in agricultural science and journalism, he served during the Civil War as a military investigator of fraud and corruption. This was followed by a career in law, which he later combined with journalism, reporting on spiritual phenomena. Olcott is especially admired for his work among the Buddhists of Sri Lanka, Burma, and Japan, helping them realize the essential value of their own heritage (that is, one of the essences which is inculcated by Ananda throughout the last 125 years. The patriotic love for the country!) . The administrative skill and public activities throughout the world were largely responsible for the society's growth and organizational success. The Buddhist Theosophical Society opened a number of schools in different parts of Sri Lanka for the higher education of Buddhist children. Over the last 125 years, Ananda College has produced Sri Lankans who always put their country first over self. But country requires more Anandians of this calibre at this critical juncture. This is for a better tomorrow and better day for our next generation.